“Look! There’s the sun!” It was my husband Michael’s exclamation as we stood on deck aboard Silver Shadow docked in Skagway. “WHERE??? ?” I asked, my head flipping skyward with such force that I’m surprised I didn’t get whiplash. “There!” Michael pointed. I followed his outstretched arm to see Norwegian Cruise Line’s Norwegian Sun making her way into the harbor. Michael thinks he’s such a riot sometimes. Since boarding Silver Shadow in Vancouver for our Alaska cruise, rain and cold have been our constant companions but today it won’t matter. 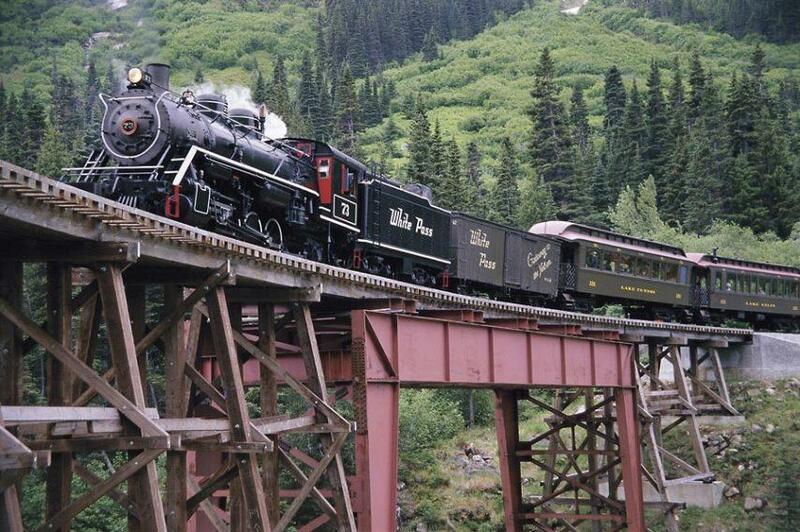 Today, we’ll board an historic steam train for a scenic ride along the White Pass & Yukon Route, a journey that climbs from sea level in Skagway to almost 3,000 feet at its summit. Best of all, it will be warm and dry inside the charming vintage wooden carriages. And there’ll be booze. The story of the White Pass & Yukon Route is one of those tales that we lazy inhabitants of the 21st century can barely believe: a harrowing story of construction crews triumphing over impossibly harsh terrain, hazardous obstacles and unimaginably frigid temperatures to blast and pick away at 110 miles of solid rock and create a railway in a mere 26 months. I couldn’t re-design my kitchen in 26 months. Today, our ride aboard the steam train not only celebrates the engineering marvel that is the railway but also provides an unobstructed view of Alaska’s jaw-dropping beauty and vastness. From the comfort of the train’s carriages, we marvel at clouds hovering over snow-topped mountain peaks, icy glaciers, cascading waterfalls and endless fields of spruce, pine, birch and wildflowers. During some impossibly tight turns, those of us in the back carriages can actually watch the front car chugging along in the lead, steam billowing out the top like a child’s toy choo-choo train. Back aboard Silver Shadow, it is after dinner and the sun is just beginning to set on this Northern landscape as we sail toward Sitka. Some of us who travelled The White Pass & Yukon Route assemble in the elegant bar to chat about the day’s excursion, our cruise so far and, of course, whether the weather might improve the following day. In my plush surroundings, an expertly mixed cosmopolitan in my hand, I think about what the 35,000 hardy and courageous souls who built the railway endured during its construction. Suddenly, I realized there are much greater hardships in life than carrying an umbrella. Five Faves: Cruise, American Style!